When did you last look yourself up online and what did you see? You can be quite sure that people will check you out before doing business with you. Guess where they are most likely to find you – LinkedIn. Why? Because LinkedIn has a very high authority and ranks better than other places where you may have a profile online. You only get one chance to make a First Impression and you should make sure that all your online profiles are good. But the most important profile to get right is your LinkedIn profile. Why is it is the most likely “landing page” for people checking you out? 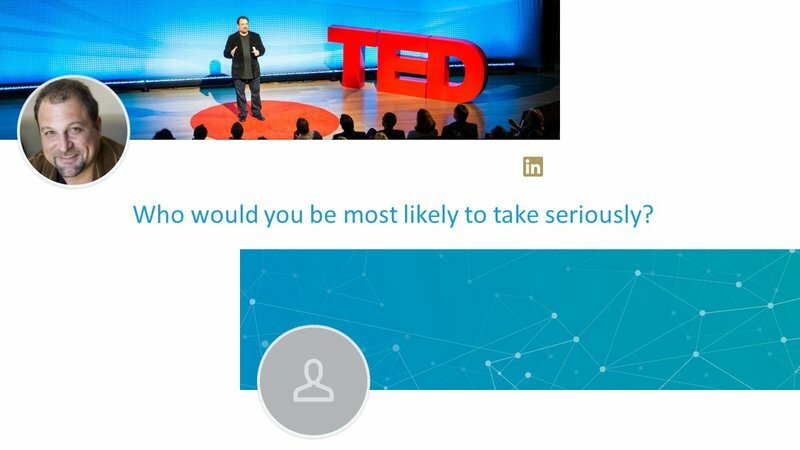 Because your LinkedIn profile is most likely to be on the first page of a Google search. In terms of a First Impression, people will decide based on the imagery and the words that appear on your profile, without scrolling down. Most profiles do not include a background image which is a huge wasted opportunity. Especially as you can include words on the image you can quickly convey something about yourself. Some profiles either leave their personal picture off altogether (what is someone trying to hide?). Others use an impersonal image such as a logo (again, what are they trying to hide?). If the First Impression is favourable then people may scroll down to find out more, and that is where you can really influence things. I will save how to do that for a future article as it has little to do with the opportunity to make a good First Impression. If you know your profile needs a makeover, read this. Get in touch for a free consultation and, if nothing else, we can help you out with a personalised background image. To receive information like this hot off the press and share it with your contacts, please complete the form below.